Claiming these are the best fudgy vegan gluten free brownies, EVER is a hefty claim. The responsibility, the expectations... many would not go as far to say that they have the best recipe, but we're ready to blow your mind (and tastebuds) with these super simple, incredibly delicious gluten free and vegan fudgy brownies with our extra thick dark chocolate fudge (because who doesn't want more fudge on fudgy brownies)! 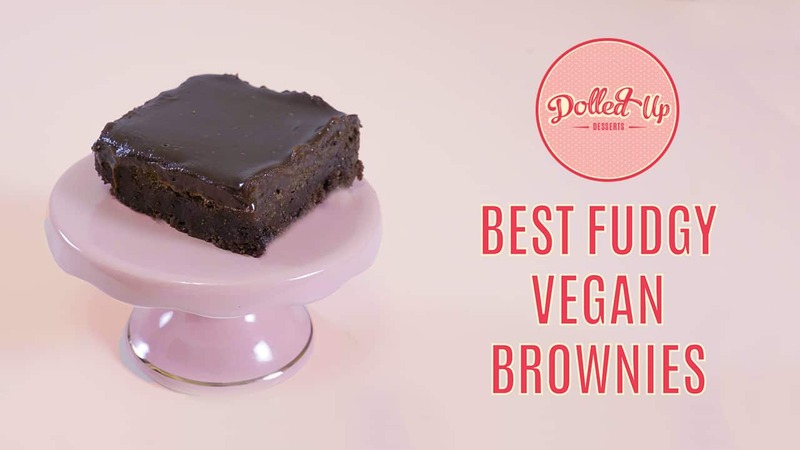 Over the years, the Dolled Up Desserts team has done a considerable amount of trial and error, online research and recipe development to perfect a classic brownie that is as delicious, if not better, than the animal and wheat containing counterpart. What we've discovered is that there are a few fundamental rules that make a brownie, with or without eggs, butter and wheat, a brownie. This article is a bit technical, but we hope that it will help you understand the science behind making the perfect brownie making! Remember, you can scroll down to the bottom of the article for the recipe and the recipe video! Looking to infuse your brownies with cannabis? Read on! We have left some instructions to infuse your brownies safely at the end of this article. Also check out our article on Vegan Cannabutter HERE! The key to success for a fudgy brownie: finding that perfect balance between fat and sugar. Want to learn more about function of fat in baking? CLICK HERE for our theory video! The function of fat in brownies is to increase moisture and richness. That buttery fatty mouthfeel you get when you bite into a fudgy brownie is, believe it or not, due to the fats! However, depending on the saturated fat content of the fat, how its incorporated, and how much sugar is used, your brownie will end up cakey or fudgy. 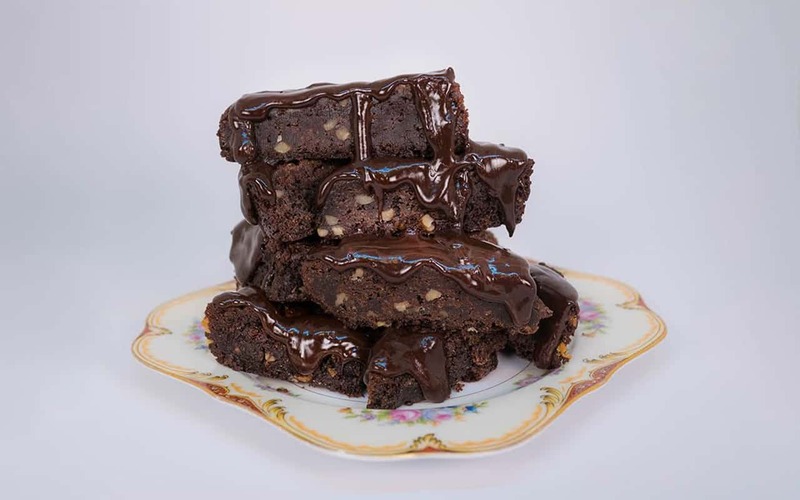 A traditional rich and fudgy brownie uses high saturated fat butter (84% fat solids), dark chocolate and many eggs to increase the fudge factor. In our vegan brownies, we use coconut oil and dark chocolate to help increase the fat specifically. Coconut oil has the highest saturated fat content of all vegan oils which helps retain the brownies moisture while baking. The high saturated fat content also leaves that buttery mouthfeel behind. Its neutral flavour, as well as its ability to be turned into vegan cannabutter, makes it the ideal candidate for fudgy vegan brownies. In this recipe specifically, we combine melted coconut oil with high quality melted dark chocolate for a few important reasons. We can increase the saturated fat and fudge factor with the cocoa butter naturally in dark chocolate. The sugar in dark chocolate, although minimal, also helps play a role in increasing water retention while baking. Last, the extra chocolate increases that deep chocolate flavour we all love and crave in a fudgy brownie. The chocolate is totally optional and you can get away with just using coconut oil. However, to make the best fudgy brownies, ever, you need to add high quality dark chocolate. All of this aside, one of the critical fat contributors to traditional brownies are eggs. Eggs are one of the most important ingredients that increase the fudge factor due to their natural lecithins. Lecithin is a molecule that binds to both fat and water equally. With lecithin present, water and fat get evenly dispersed around a treat, resulting in better consistency. Since these are vegan, we need to increase the fudge factor in a cruelty-free way. Sweet potato is our favourite egg replacer for brownies because of its moisture content and mild, slightly sweet flavour. It manages to add weight to the brownie without causing it to boil (whereas increasing the oil content would deep fry the brownie), and the fibres of the potato help bind the brownie together. Milled flax seed is our other go-to egg replacer, as it also helps bind the brownie and increase moisture (the flax produces a sticky substance when rehydrated). We have found that a flax seed produces a slightly more cakey brownie, and the seeds can get stuck in your teeth. So for the purposes of the best vegan gluten free fudgy brownies EVER, we recommend mashed sweet potato! If you want to see 12 different egg replacements for brownies in action, click on our trial and error video HERE! Last thing to note is how to incorporate the fats. If you have an electric hand or stand mixer, it is ideal to beat everything on low-medium speed for 2-3 minutes. That way the potato does not remain as large chunks, the fats get aerated and everything becomes homogenous. You can use a spoon or spatula as well, but you may not get a result as consistent as you would with using an electric mixer. The Other Critical Factor: Sugar! Want to learn about the function of sugar in baking? CLICK HERE! Fat is critical to fudginess, but so is sugar. The traditional fudge brownie uses a ridiculous amount of white sugar as well as some brown sugar. White and brown refined cane sugars are the best for increasing that ooey-gooeyness because of their small surface area and affinity for water. They disperse well in a baked good because they are small, dissolvable crystals. Other sugars work, but to reach critical fudge, you MUST use at least some white granulated sugar. To learn more about white and brown cane sugar and how to tell if they are vegan, watch our video review of vegan cane sugars in baking HERE! As much as white granulated sugar is necessary, we also do not want our brownie to be overly sweet. We can reduce the amount of cane sugar and substitute some maple syrup to help add moisture. Maple syrup will not retain moisture like a granulated sugar, but it will add depth of flavour and a natural sweetness that is quite enjoyable relative to purely using white sugar. You should beat your sugars in with the fats and egg replacers to ensure the sugar is evenly dispersed throughout the whole treat. If using the Dolled Up Desserts Bettie's Brownie mix, beat the maple syrup with the fats. If making your own recipe, be sure to mix the sugars well with the fats and eggs (2-3 minutes on medium speed). Fudginess comes from a lack of mixing. Mix your wet ingredients well until homogeneous, but gently fold your dry ingredients in with a spatula. If you are using our baking mix, the flour blend has been formulated to be extra fudgy and rich (thanks to the chick pea and almond flour). If you are using wheat flour, be sure to mix minimally, just until the flour is fully combined and no dry pockets are present or else your brownies will be tough. If you are using another gluten free flour, ensure that it is not primarily rice based or else your brownie will be gritty. Put a simple fudge on top. It helps diversify textures, improve chocolatey flavour and visual appeal of the brownies. Our fudge recipe is very simple to make thankfully, and will leave a beautiful glisten on your brownies. Add chocolate chips or chopped walnuts to the batter. It will diversify the brownie texture, leaving a satisfying crunch to cling to while in the midst of fudge city! To summarize all of that, check out our video on how to make the best vegan gluten free brownie, ever! Be sure to hit subscribe! If you are 19+ years in Canada or 21+ in some United States, you may be looking to infuse your brownies with cannabis for personal consumption. Before doing this, PLEASE READ OUR ARTICLE ON VEGAN CANNABUTTER . It will provide you with safety tips, infusion technique, and overall know how of the legalities with using cannabis responsibly in edibles. NOTE: Infusing your brownies with cannabis is completely optional. 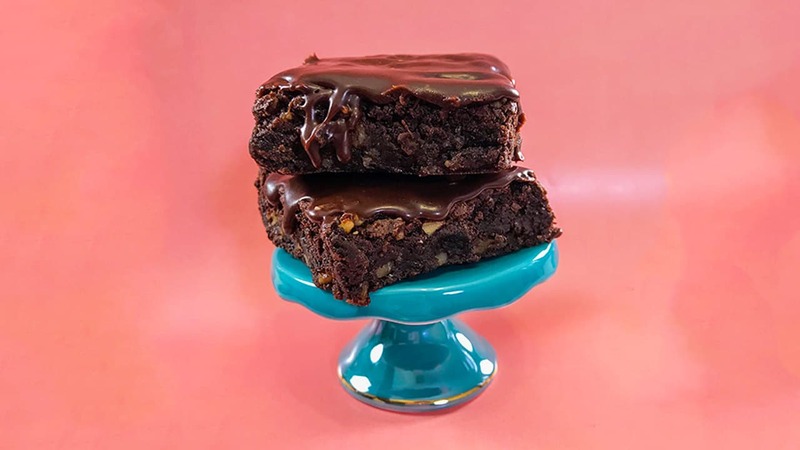 We provide these guidelines as a safe recommendation, but you can easily make the best vegan gluten free fudgy brownies, ever, without cannabis. Remember to infuse your cannabis with the intention of using the resulting cannabutter entirely for these brownies. Pre-determine how many brownies you want to get out of the batch to help inform the dose you wish to consume. Whether you want nine 3"x3" large squares or thirty six 1"x1" squares, determine the dose you are comfortable with. We recommend dosing at the legal Canadian dose to start, especially if you are new to DIY edibles. The legal dose per serving in Canada is 0.01g. For 36 small cannabis brownies, you would infuse 0.36g of cannabis into 1/2 cup (105g) of coconut oil. If you choose to infuse more, that is your personal choice and risk. Another key to ensuring near perfect dosing is to use 5-10 grams of sunflower lecithin, added during the wet ingredient stage. Sunflower lecithin is a naturally, non-GMO occurring additive that, like egg lecithin, binds to both water and fats. Since water binds to sugar and lecithin, and lecithin binds to fats, using lecithin will ensure the cannabutter is evenly dispersed in the brownies with the water and sugar. Be sure to mix your wet ingredients incredibly well, adding an extra 2-3 minutes to the mix time. 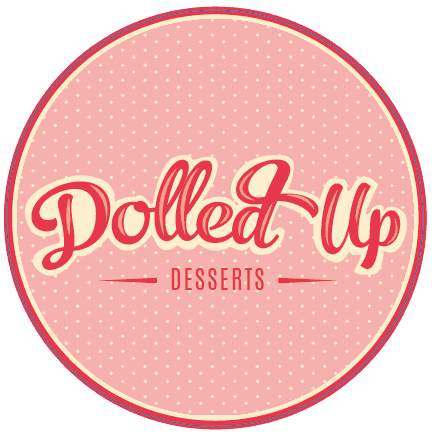 Dolled Up Desserts is not responsible for any damages or liabilities that stem from that choice to infuse more, and your resulting actions and behaviours that follow. We want you to be safe above all, so infuse low and slow, don't consume cannabis and drive, and enjoy with other adult friends in the comfort of your own residence. The most critical part of making fudgy vegan brownies is fat to sugar ratio. To achieve critical fudge, we have perfectly balanced coconut oil, dark chocolate, white sugar, brown sugar and maple syrup. Top it off with our super simple vegan fudge sauce and you're in for a real treat! 1/2 cup Coconut Oil, melted. You can sub in our Vegan Cannabutter here! Please read post above for more details on dosage. 1/3 cup Mashed Sweet Potato You can use the flax included with the mix if desired. Preheat oven to 350 F. Line 9x9" baking pan with parchment paper and set aside. Using a stand or hand mixer, combine coconut oil, maple syrup, 2/3 cup melted chocolate and sweet potato OR flax egg in a mixing bowl until well combined. Beat on medium speed for 2-3 minutes. Fold in baking mix using a spatula. Before it is fully combined, add in the hot black coffee. Batter will be thick, sticky and not very runny. Bake for 25 minutes. Let cool completely in pan. While the brownies are baking, in a small sauce pot, melt chocolate with oil and condensed milk on low heat. Once liquid and shiny, take off the heat. Do not let it boil or cook longer than the point when it is melted. Pour sauce all over your brownies. Let cool in the fridge or freezer so the sauce sets. Cut and serve brownies... or eat with a fork right out of the pan. Brownies can be cut and stored in an airtight container at room temperature for 48 hours, in the fridge for 4 days or freezer for 3 months. If you are making cannabis infused brownies, be sure to freeze your portions immediately in an airtight container to prolong the shelf life of the cannabis.